I look for the brightest light that illuminates my subject. Outside the brightest light usually comes from the sun. Inside it could come from an overhead light, or a day-lit window. Generally, light bounces off a subject first where the subject is closest to the light. 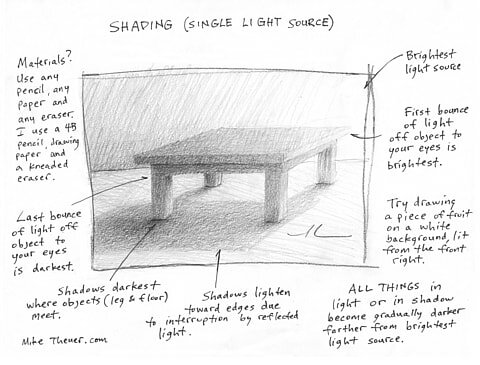 If I'm drawing a table near a day-lit window, for example, light will bounce off the area of the table nearest the window first. In reality it will bounce off just one spot first. That spot splits the shortest distance between the light, the table, and my eyes. This spot or "first bounce" is where my subject will be the brightest. As my subject stretches away from the light it will become gradually darker until the darkest spot where the light bounces off last. Both areas of light and of shadow become darker farther away from the light. Where one object meets another like a table leg meets the floor, the shadow will be darkest of all. And from this meeting point the shadow will gradually lighten toward the shadow's edge. Most all shadows lighten toward their edges as they become more interrupted by reflected light. EXERCISE - Find a piece of fruit or any similar-sized object. Place your object on a piece of white poster paper. Fold half of the poster paper up in the back and support it from behind to create a standing backdrop. Then light your object two feet from the front and two feet to the right with a spot light or a lamp. Tilt the lamp shade toward the object. Whatever lighting you choose, be sure to shield your eyes from the light. Then draw!